I HAVE had a dig back through my photo albums and found a few clangers. Mutton leave sleeves on debutante dresses for one – not mine, mind you, it was my sister's. I did have a fancy frock for my final year formal. It was a dinner dance, which looking back now seens so very sophisticated for a bunch of 17 and 18-year-olds. 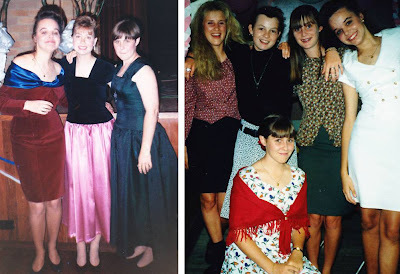 Having had three of our lot head off all dolled up to their own final year formals I’ve had a chance to marvel at the expectations we all had – that they had. All three of ours have gone off giggling and excited to year 12 formals only to return deflated. The primping and preening and planning that goes into the whole affair was, for all of them I think, more exciting than the actual do. Maybe it’s a lesson in enjoying the journey. Sometimes the guide books have talked up the destination. Hmmm, I was going to chat about my final year formal frock but maybe we should chat about life, or rather our expectations for our lives. What do you say? Any thoughts? For example, do you ever find yourself wondering if the modern day guidebooks to life – the internet, newspapers, magazines – are talking up the "destination"? One of ours had a crack at life this year. She, at 19, and just months out of school, moved out with her fella – do or bust. She would hear no words of caution – and who wants to be the naysayer when someone’s so full of expectation and hope. It was going to be fun, with a capital F.
Long story short, it wasn’t fun … nope, not even close. It was hard work. It was lonely. It was challenging. It didn’t feel safe. It cost a lot of money. I don’t know, maybe all those formal frocks – of whatever era – all that primped hair and carefully applied makeup is an armour of sorts. Some liken it to the butterfly emerging from the safe cocoon of the school environment. But school, it wasn’t so safe, was it? Was it? All I know is I am pretty darn OK with my lot and where I am on the path. Giving a leg up to this brood can be an exercise in frustration and can leave one entirely spent. (I defy any parent steering dependent adults to independence to say it's full of the same kind of joys that come with raising younger children.) But give a leg up we will, if only so they can look back in 20 years at those formal frocks and remember it as nothing but Fun. So, life? Any theories? Or should we just go back to talking about frocks? It's so amazing to look back and remember what your headspace was like at 17/18. So lacking in wisdom but so courageous at the same time. Great pics! Which one are you?